I’m Paula Santolaya, reporting live from SANTOLIVE in my virtual reality. Have comments, questions, or suggestions? Post them in the comments section or email me at info@santolive.com. A few decades ago, the first desktop computers were oversized and laptops were literally moved in trailers. Currently, the smallest computer in the world measures the same as a lentil according to IBM company that will present this mini PC at Think 2018, one of its biggest conference Think in Las Vegas taking place March 19-22. But small is beautiful and, in this case, also valuable. According to the company, this mini computer equips hundreds of thousands of transistors and has the power of an x86 chip of 1990, although its features are somewhat scarce compared to the current computers. But one of its strengths is its minimum cost of producing: 10 cents per unit! And many will ask: what can be done with a computer of that size and power? According to the company, its functions include packages tracking around the world, theft, fraud and forgery detection and simple tasks of AI, such as data selection and interpretation. All this is compatible with Blockchain technology. The device is still at the prototype phase but its field of application is immense. Arvind Krishna, director of IBM Research, explained that this type of computer will increase its presence in the next five years and will be implemented as a daily tool. Technology is here to stay. As the Spanish saying goes: “Esto son lentejas, si quieres las tomas y si no las dejas” (“here are some lentils, take them or leave them”). 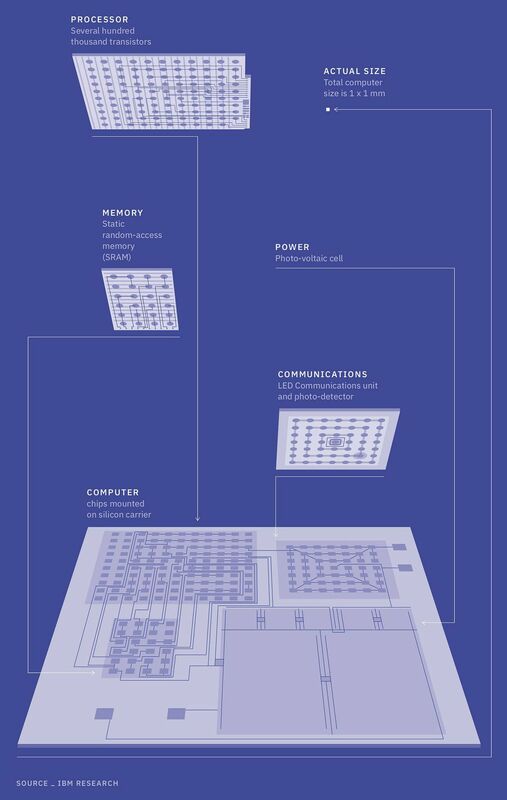 Diagram of the different parts of the computer created by IBM.